Ayurvedic remedies are time-tested and proven to be the best for hair. They are healing for the scalp and beautifying for the hair. 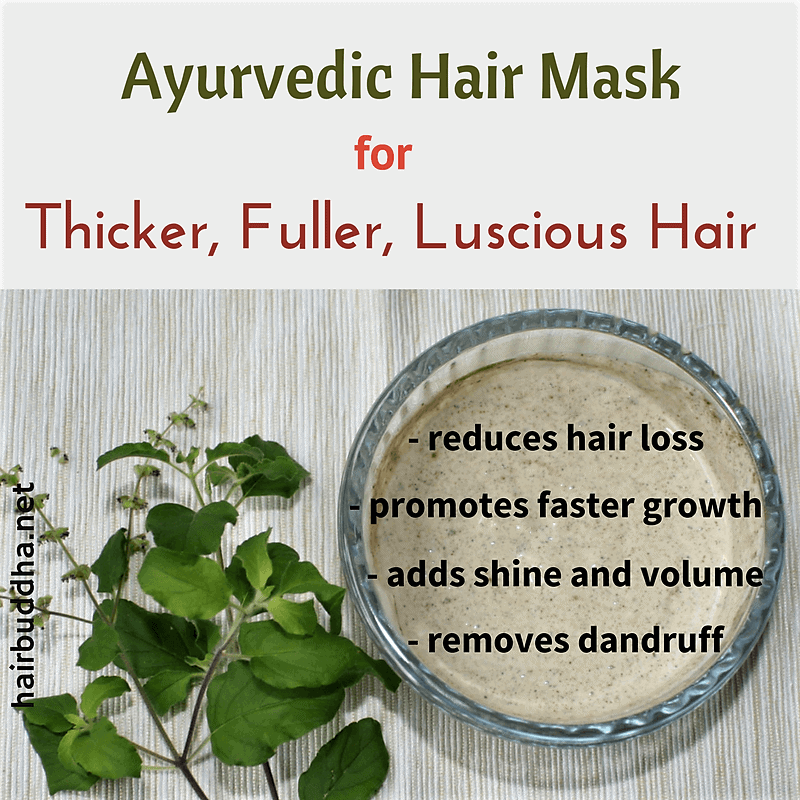 If you have not explored any ayurvedic herbs yet, give this hair mask a try. It has the herbal power to make your hair nothing short of fabulous. Before we delve into the ayurvedic hair mask I want to tell you little about ayurveda – the term we hear so widely now. But if you interested in just the hair mask, scroll down for the recipe. 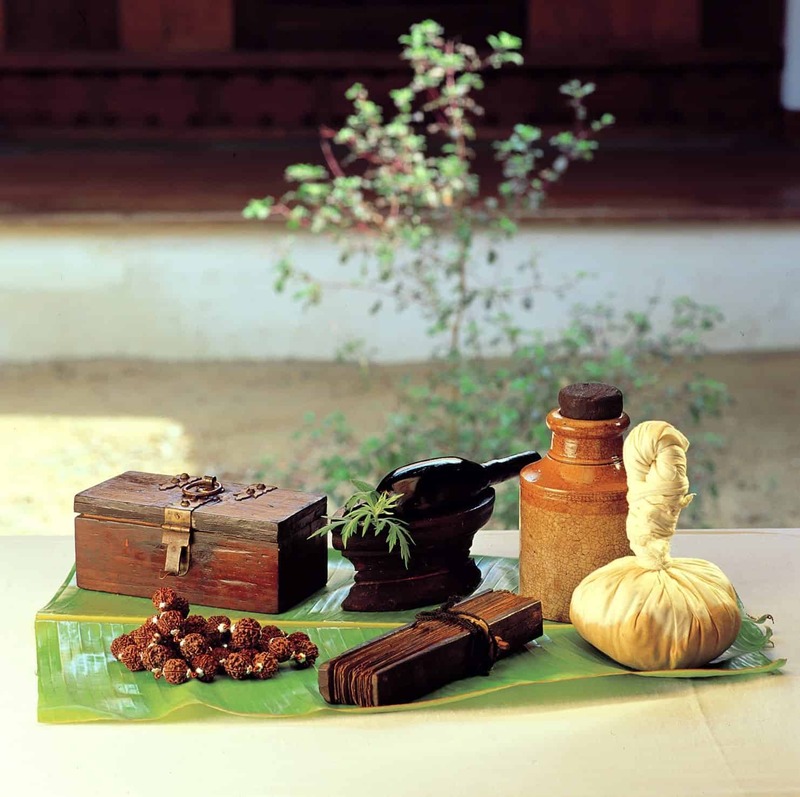 Ayurveda is one of the oldest holistic healing systems of the world. Sadly, this science and the great practitioners of this science are becoming extinct. Although the word ‘ayurveda’ has become very popular, and you hear it all the time – when buying natural products, or going to a spa, its core essence is rarely practised. A proficient practitioner of ayurveda treats you without asking any question about what’s wrong with you, nor will he/she ask you for any diagnostic tests. So how do they do it? Through nadi vigyan, or pulse diagnosis. Because blood flows through every single part of the body, a trained practitioner can feel any imbalance in any part of the body in the pulse. Through the pulse, he/she also comes to know the interaction and balance of mind-body systems. In addition, the physician assesses the posture and body language, emotions on the face and tone of the voice. Ayurveda takes a holistic approach where the aim is to balance the body and boost its own healing intelligence. I have always been sceptical of ayurveda because it’s fed to us since childhood that ayurveda is a sham. I recently had a firsthand experience of how powerful this system is when I took my dad to a very old and well known ayurvedic practitioner. My dad has had painful cramps in his leg for last 30 years – he couldn’t sleep peacefully at night as they were so bad. No amount of mineral supplements or allopathic treatment helped in any way. This ayurvedic practitioner, Dr Joshi, asked my dad his age, what he does, where he lives and then examined his pulse for a few seconds. And the next question he asked him was ‘do you get cramps in your legs‘. I was completely blown away—how did he know. Now I was curious to see whether his treatment can stop my dad’s cramps. And it did. Dr Joshi gave my dad food and lifestyle recommendations, plus some ayurvedic medicines. And since my dad prays, but not regularly, he asked him to pray every day, and have a positive and lighter approach to life. You won’t believe in 3 months time, his leg cramps just vanished. Simply vanished. And he had suffered them for 30 years. Such outstanding doctors are becoming extinct. One, because Indian people don’t have faith in ayurvedic doctors. And second, because the new ayurvedic doctors don’t have confidence in themselves. It’s a 5-year full-time study just like medical school, but there is little research going into it. It’s a vicious cycle. And we have a lot of quacks (both in India and in the West) who call themselves ayurvedic practitioners just by doing a few weeks course. It’s a shame they do that. The good news is that people like Dr. Joshi have kept the practice of ayurveda alive and are driving force behind it. The real aim of ayurveda is not to treat the specific symptoms but promote good health by correcting the imbalances of the body. So that the delicate balance between the mind, body and spirit are in harmony and you are left brimming with health and happiness. That was a bit about ayurveda, let’s come back to the hair. In this hair mask, I am using my most favorite ayurvedic herbs. And they work really well with each other to promote strong, shiny and luscious hair. Who can use this mask: everyone – whether your hair is dry or oily, fine or coarse, frizzy or damaged. Also if you have excessive hair fall or dandruff, it will benefit you. Shikakai: Also know as fruit for the hair, shikakai has been used in India for centuries to promote healthy hair. It is naturally ph balancing and helps to detoxify the scalp and strengthen hair roots. Shikakai also has mild conditioning properties that increase bounciness and silkiness of hair. 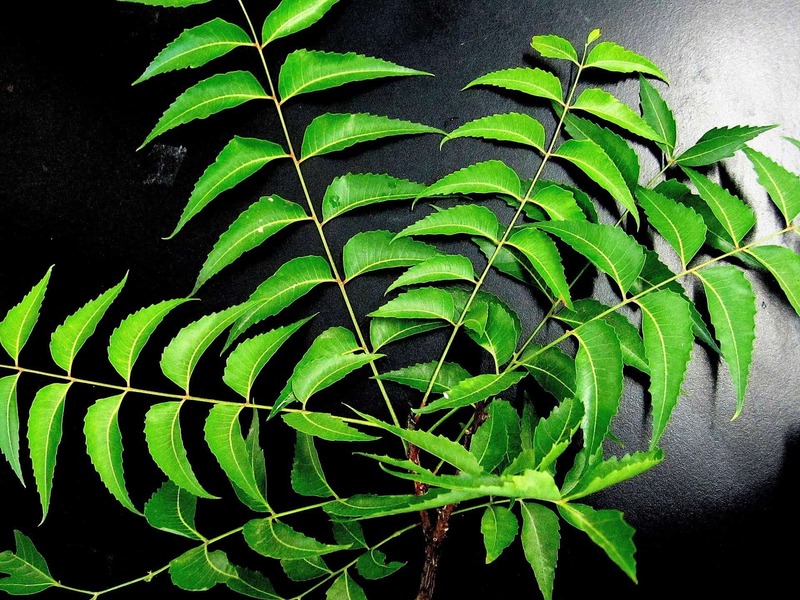 Neem: Neem is fantastic for your scalp issues. Its antiseptic, anti-fungal, antibacterial and anti-viral properties effectively heal irritated skin/scalp conditions like eczema, psoriasis, acne, hives and dandruff. Neem is also a great detoxifier and speeds up the removal of toxins from the scalp that could potentially damage hair and slow growth. Tulsi: Another important herb in ayurveda, tulsi stimulates scalp circulation and promotes healthy hair growth. Plus, the abundant antioxidants in tulsi protects the hair from free radical damage— which can cause hair thinning and hair loss. Tulsi is also beneficial for dry, itchy scalp and enhances the shine of hair. Yogurt: I love using yogurt as a base in my hair mask for various reasons. It is very moisturising and nourishing for hair. It’s also rich in protein which will help strengthen the hair follicles. And if your hair is feeling dry, brittle and dull, yogurt will fix it up for you. It is a known hair softener, plus it adds a great shine and softness to your hair. Combine all ingredients in a bowl and use immediately. Or you can let it soak for 30-60 minutes — Soaking helps herbs release their nourishing properties into the yogurt. Start with dry or damp hair. Apply this mask to your scalp and hair. Put on your shower cap or wrap your head in a muslin cloth or a towel. Leave this on for 20-30 minutes, then rinse off thoroughly. Wash with a natural shampoo and let your hair dry naturally. Do this mask once a week to restore and maintain your hair. Using yogurt: For this mask, it’s best to use plain, whole fat yogurt. Also, prefer yogurt with live cultures, as it has an extra benefit for the scalp health. If you make it at home that is the best. Yogurt substitute: If you are a vegan or don’t like putting yogurt on your hair, you can replace it with coconut milk. It offers similar hair benefits as yogurt. Oiled hair: You can apply the mask on oiled hair, just don’t add the extra oil when preparing the mask. You will find most of the ingredients in an Indian shop. But can also purchase them online. Buy tulsi powder here, or if you can get tulsi leaves then, use their paste. You can also dry and powder them yourself. 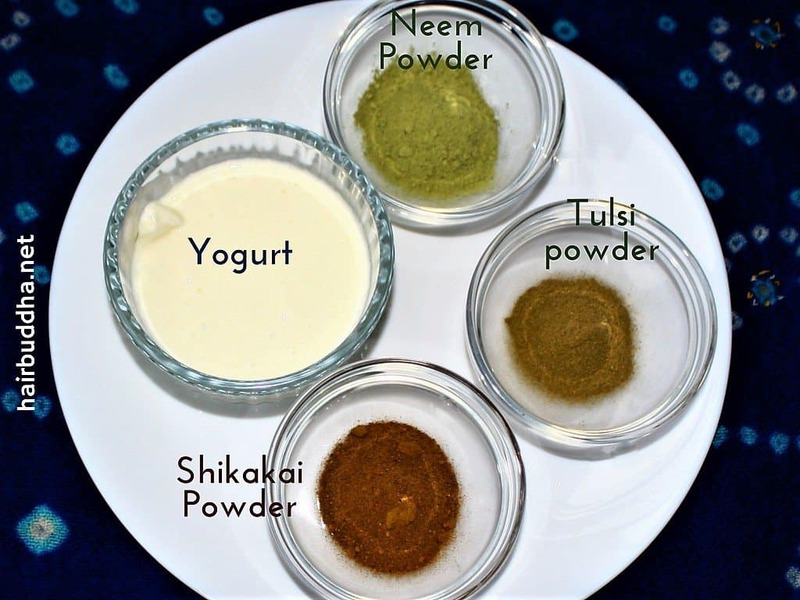 Buy neem powder here, or you can also buy dried neem leaves and powder them yourself. Buy rose petals powder here, or collect fragrant rose petals, dry them in sun (keep them near radiator) and powder and store of later use. What are your favorite ayurvedic herbs for hair? Share below! can we use neem oil instead of neem powder? Hi Minaz, thank you for the lovely articles. I found them very very useful. I have few doubts regarding the usage of neem and tulasi powder. If I need to use fresh neem and tulsi leaves what is the best way to add them to the mask? Also, is this hair mask good for dry and thinning hair? Hi Deepti, glad you find them useful. Grind tulsi and neem leaves into a fine paste and use. Yes this mask will help dry thinning hair. You can also add some coconut milk to it. Let me know how it goes. This is such an awesome article both on the greatness of ayurveda and the ayurvedic knowledge you have shared for hair care. All your articles are. Thank you.